Andrew McCarthy – the writer. 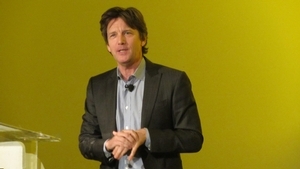 No, not Andrew C. McCarthy, the right wing columnist for National Review who nips constantly at Obama’s feet like a rabid chihuahua, but Andrew McCarthy the actor known for his roles with a group of colleagues known as The Brat Pack in films such as Pretty in Pink and St. Elmo’s Fire. That Andrew McCarthy has developed into a respected travel writer for the New York Times and Atlantic, an editor at large of National Geographic Traveler and the author of a New York Times bestseller, The Longest Way Home. He was the keynote speaker at the Abercombie & Kent 100 Club meeting that I attended in Chicago last week. And I was impressed; dare I say, moved. I didn’t know his name and when I placed him as the actor, I didn’t say anything. I didn’t want to be one of those people who blurts out something incoherent when he encounters a famous person and disrupts that person’s private moment. So I just sat there next to him and his friend as they talked and I continued doing my own thing. It was later that I learned he had become a respected travel writer. At first it did seem incongruous, putting together the pretty-faced actor with the image of a travel writer. I hadn’t had time to catch up to his writings and when I learned he would be speaking at the A&K event I didn’t know what to expect. I had heard snide comments such as, “He didn’t write that stuff…” based on nothing, I suspect. Of course it’s true that there are plenty of bestsellers by celebrities and politicians that are really produced primarily by ghostwriters. In the case of McCarthy, however, I suspected there was more to it. He wasn’t producing some kind of “tell-all” memoir, he was writing about travel. So I gave him the benefit of the doubt. When I heard him speak in Chicago I became a fan. I found myself agreeing wholeheartedly with his message and being happy that he was taking that message to people. It was easy to see that the rest of the audience was also taken. It’s always a good way to win over an audience by buttering them up, of course, but when Andrew McCarthy told the travel agents and tour operator staff at the Four Seasons that they were “the last best hope of the world,” it was more than just flattery. Hyperbole, perhaps, but I knew what he was talking about. I share his conviction about the importance of travel in the ongoing progression of the great human experiment, which often seems fundamentally imperiled in today’s world. We agreed with him and it pulled the audience together in the recognition of their identity with one another, the shared purpose of everyone in that room. We aren’t just a bunch of strangers. We have a shared purpose, much in common on a fundamental level. There is something that separates dedicated travelers from people who don’t care about travel. There is a difference, he said, between traveling and vacationing. Sitting on a beach is a nice rest, but when you get back, after a few days you are stressed out again. Travel however is something else. It’s transformative. Eventually the episode played out, he gathered his things and proceeded to the next village. The next day when he woke up he felt different. He realized then, he said, that he had always been driven by fear, that it was so ever-present that he wasn’t aware of its existence until that moment when he experienced for the first time its absence. As he finished his story and wound to his conclusion, he asked for a show of hands: how many don’t have passports? No one responded. Then he explained why. “I think America is a great place,” he said. “I know I’m preaching to the choir, but I think America is a very fearful country and I think we make a lot of our decisions based in fear. And I think personally we make a lot of decisions based in fear. Not every fearful decision I’ve made has been bad, but every bad decision I’ve made has been based in fear. McCarthy included himself as one who is joined in the quest of those present to encourage others to travel. And I agree with that. And that’s why I am a fan of Andrew McCarthy.